I love the beach! I love the colors of the water and the sunsets, the smell of the salty air and the feel of the sand between my toes. Most of my beach time happens in the summer, so with summer upon us here in Texas, I thought I would feature some projects that reminded me of the beach. First off, projects that would be great for wearing to the beach. 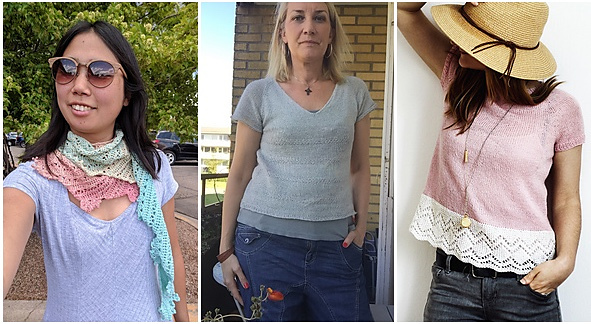 From left to right: keltronica’s Goblin-Cleaver, miastick’s Edie 2 and Annetta13513’s Summer Vibes. 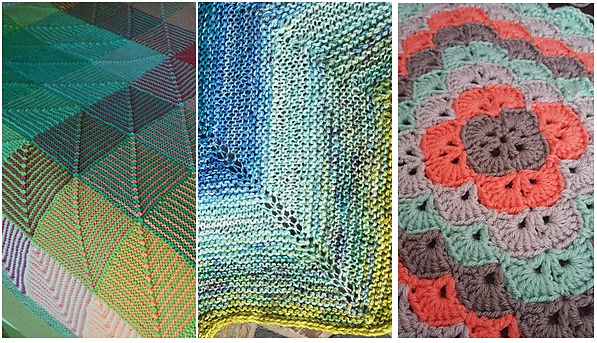 I also found these projects with colors that reminded me of the beach. From left to right: GeorgiaRain’s Hue Shift Afghan Soft Colorway, Ssteinkwller’s Like Watercolors in the Rain and catsandcrochet09’s Beautiful Shells Baby Blanket. Wherever you are today, I hope this post brought some beach to you. I can’t wait to pack my works in progress and hit the beach this summer!